We drive innovation and growth from New Zealand's forestry, wood product and wood-derived materials and other biomaterial sectors for the benefit of New Zealand. Our partners and investors include industry, government, Māori, universities and research institutes. We offer consultancy, technical advice, testing, pilot plant development and commercialisation of research plus specialist publications, databases and collections. Scion's Ligate™ bioadhesives are free of petrochemicals and formaldehyde and made from 100% renewable plant resources including lignin, a by-product of papermaking. Our water-based, non-toxic bioadhesives are compatible with existing adhesive and panelboard manufacturing equipment. 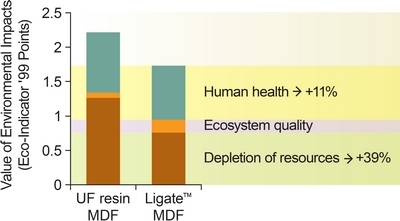 A life cycle analysis has shown MDF made with Ligate has a 22% lower environmental impact over its entire lifecycle compared with conventional adhesives containing petrochemicals. Ligate use in plywood and other wood panel products for interior design applications and furniture will help ensure we live and work in healthy homes and offices. The bioadhesive’s composition scavenges formaldehyde from the air contributing to formaldehyde emissions lower than those of natural wood. Ligate™ technology was awarded 2016 Biotechnology of the Year at NZBIO’s annual conference in September. Dr Will Barker, Chief Executive of NZBIO, said “the technology is a game changer for wood panel manufacturers”. 2016 NZI Sustainable Business Network Awards – Finalist, Renewable Innovations Category. 2016 NZ Innovators Awards – Finalist, Sustainability & Cleantech category. Copyright © 2017 New Zealand Forest Research Institute Limited, trading as Scion.